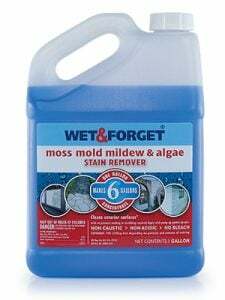 Wet & Forget Outdoor eliminates outdoor mold, mildew, moss, lichen and algae. It requires no scrubbing, no rinsing and no pressure washing. It goes to work with the wind and rain to gently eliminate unsightly and tough growths over time. Hi, Marlene! We do recommend having this for the most effective application. Do I need to purchase a garden sprayer to use this.